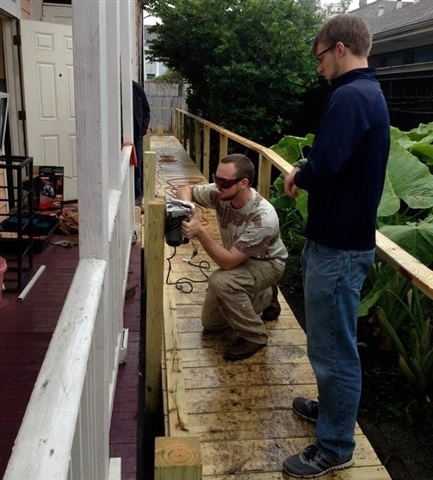 Over three Saturdays in November, NOLA Wesley Foundation constructed a handicap-accessible ramp and deck for Luke's House Clinic, a non-profit free clinic helping the underserved of New Orleans. Each day, the team of eight students worked alongside Rev. Max Zehner, NOLA Wesley director, to complete the project. NOLA Wesley member Caleb Hicks coordinated the effort, also serving as designer and architect for the ramp. Caleb is a New Orleans native and Tulane University architecture student. In addition to Hicks and Zehner, participants included Joanna Johnson, Caroline Germany, Andrew Smith, Nick Miller, Alec Itin, Alex Sloan and Liza Barwick. The project was submitted to the Drew Brees "Super Service Challenge". Through this initiative, nonprofits are eligible for grant dollars from the Drew Brees Foundation for groups who donate their time to a service project for an organization of their choosing. To view the video that was submitted for the Super Service Challenge, click here. 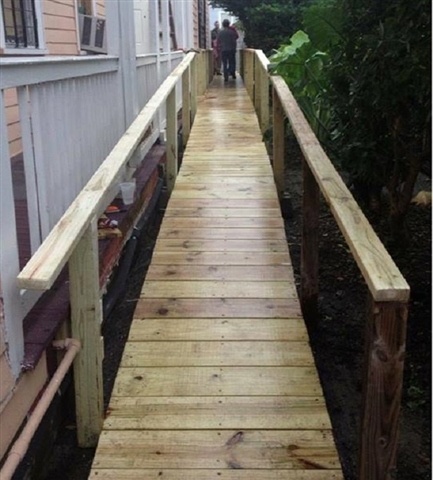 Photos from the ramp construction are available on the Luke's House Facebook page.